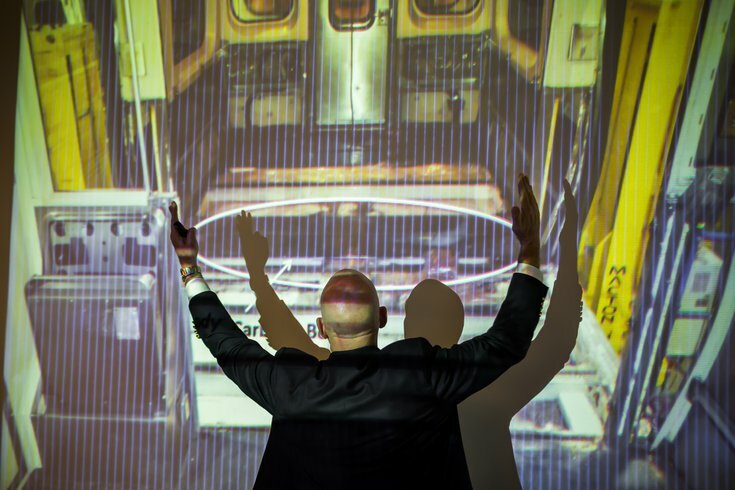 SEPTA General Manager Jeff Knueppel indicates the location of a structural bolster beneath the floor of a Market-Frankford subway car during a news conference on Monday, Feb. 6, 2017. SEPTA said Monday afternoon it had found cracks on the undercarriages of 58 cars used on the Market-Frankford Line. The cracks were found in a motor-cooling vent welded onto the bolsters of some of its El cars. The vent cracks had severely compromised the structural body bolsters on two of those cars. There were no issues on cars without the weld, said Jeffrey D. Kneuppel, SEPTA general manager. Only cars that have been inspected and deemed safe have been running on the line since Sunday, SEPTA said. Inspection of all the M-4 subway cars has now been completed. By Monday night, 108 cars will be in service. The first crack, eight inches long on a 23-inch bolster, was found on Car 1091 by a mechanic conducting routine, five-year maintenance on Friday night at the 69th Street Carhouse. A second cracked bolster was found on another car during a follow inspection. The agency is conducting metallurgical testing to determine why the vent cracks migrated to the bolsters on those two trains. Kneuppel said a welded repair will likely have to be made, but no decision has been made. 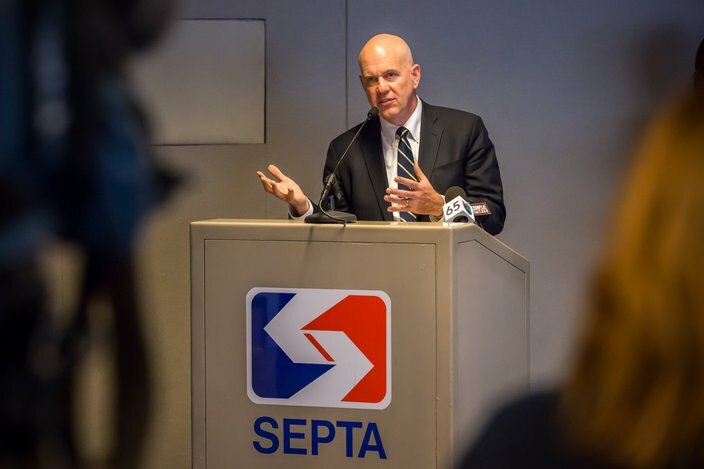 SEPTA General Manager Jeff Knueppel spoke during a press conference, Monday, Feb. 6, 2017, discussing severe cracks found on two Market-Frankford subway cars. The location of the cracks is the most stressful point on the car body, he said. It appears to be an assembly and weld problem, not a design issue. Catastrophic failure was unlikely, the general manager said, as performance problems, such as doors not closing correctly, would likely have been seen first. Monday morning's commute on SEPTA's Market-Frankford Line was no worse than it typically is, despite about a third of the elevated line's fleet – 38 cars – being out of service. Those cars will remain out of service Tuesday. “It was about what you expect … from SEPTA,” rider Tom Craig said, during the middle of the morning rush. Kneuppel said Monday afternoon that trains ran about every six minutes instead of the regular four-minute interval during the morning rush. Only a few buses were pressed into supplemental service along the route. He said riders could still experience overcrowding on Tuesday morning as many riders return from a post-Super Bowl work holiday. The Market-Frankford Line runs from Upper Darby to Frankford in Northeast Philly. Broad Street Line cars did not undergo an inspection since it uses a different fleet of cars. On Sunday, SEPTA had warned of possible overcrowding on the El, added some supplemental bus service, but did not change its schedule or its stops. SEPTA usually rolls 144 cars during peak hours. “I expected it to be bad, but it isn’t. Maybe people drove? It’s a nice surprise,” a SEPTA token seller said Monday during the morning rush. Jerome Tate, a newspaper vendor who works the SEPTA stop at Eighth and Market streets, said he had plenty of room when he boarded the train at 13th Street with a cart of papers at 6:15 a.m.
And while hundreds of commuters pour by him every morning, only one customer even mentioned the reduction in cars in service while Tate hawked papers for two hours on Monday. In July, 120 SEPTA Regional Rail cars were pulled from service after inspectors found a systemic flaw in the welds on their equalizer beams, another part of the undercarriage. That flaw and its repair caused a scheduling mess throughout the summer. And in November, the agency suffered through a crippling strike.